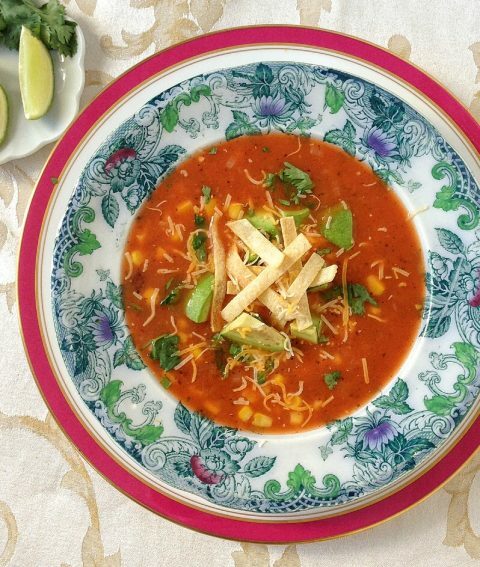 This family-pleasing tortilla soup comes together quickly with chicken or vegetable broth, black beans, corn kernels and fire-roasted tomatoes. The toppings of homemade tortilla chips, avocado, cilantro, and shredded cheese bring it all together. Every year when the Oscars roll around, we stay up late to hear the results, but then we wonder, “Why on Earth did we stay up so late? We haven’t seen any of the movies!” This year is no exception … with the exception of Lincoln. I prefer watching my movies from the comfort of my own home, and the movies I often gravitate to are the ones with a foodie theme. 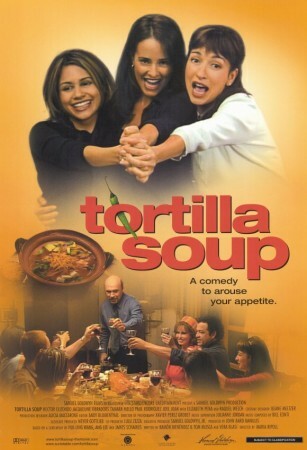 Over the years, some of my faves have been Babette’s Feast, Big Night, Eat Drink Man Woman, Food Inc., and my ALL-TIME favorite … Tortilla Soup. 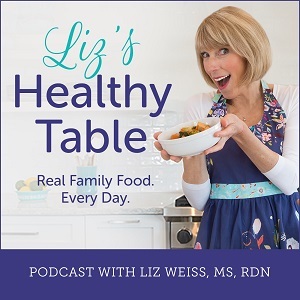 In honor of Oscar night, this month’s Recipe Redux cooking challenge theme was to create a healthy recipe inspired by a favorite food scene or featured dish from any movie. 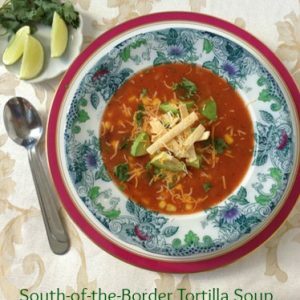 Once I heard about the challenge, Tortilla Soup came immediately to mind … and so did this bean-filled recipe for South-of-the-Border Tortilla Soup, adapted from our second cookbook, No Whine with Dinner. 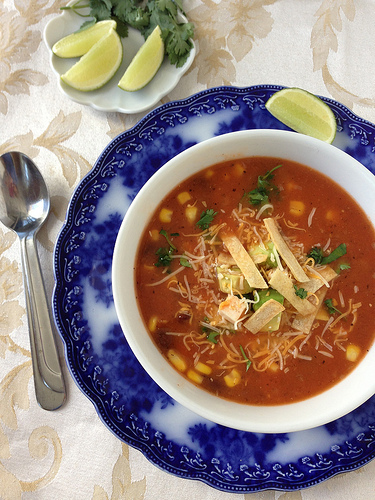 I had so much fun taking photos of this colorful and nutrient-rich soup! 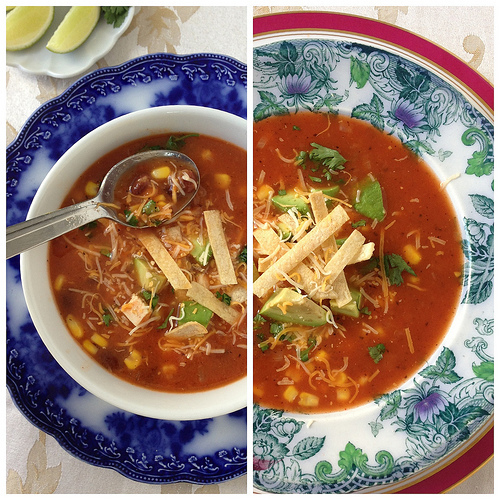 I grew up in a family of three girls — I’m the “pickle in the middle” — so maybe that’s why I loved Tortilla Soup so much. It’s about a Mexican-American family living in California. The dad is a widower, and his three grown daughters still live under his roof. 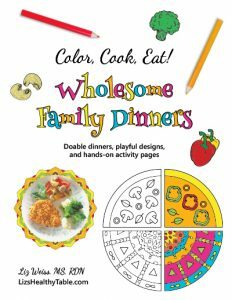 The dad is a chef, and his elaborate, home-cooked meals always bring the family together. The movie is filled with all sorts of hilarious happenings (which often unfold at the dinner table), though some of the scenes are a bit spicy. 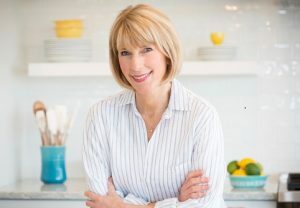 Chefs Mary Sue Milliken and Susan Feniger (AKA Too Hot Tamales) worked on the movie set preparing and styling the food. I made some tweaks to our original recipe. Instead of using a 15-ounce can of tomato sauce, I used a 15-ounce can of super-flavorful Muir Glen Organic 2012 Reserve Fire Roasted Petite Diced Tomatoes. I pureed the tomatoes before adding because my boys don’t like lumps. I added a few pinches of chipotle chili powder, and for the toppings, I tossed in some leftover roasted chicken. 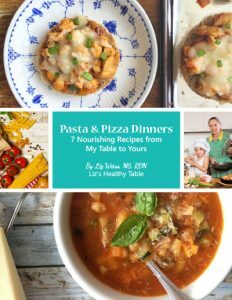 This recipe is adapted from No Whine with Dinner: 150 Healthy, Kid-Tested Recipes From the Meal Makeover Moms. It calls for making your own corn tortilla chips. But you could certainly use your favorite store-bought chips instead. I love this recipe because it's perfect for cozy family dinners and entertaining. You can make it vegetarian by using vegetable broth and opting out of the optional chicken topping. Heat 1 tablespoon of the oil in a large Dutch oven or saucepan over medium heat. Add the onion and cook, stirring frequently, until softened, about 7 minutes. Add the garlic, cumin, and chili powder and cook an additional 1 minute. Stir in the broth, tomatoes, black beans, and corn. Cover, raise the heat to high, and bring to a boil. Reduce the heat and simmer, uncovered, until the flavors meld, about 10 minutes. Meanwhile, heat the oven to 400°F. 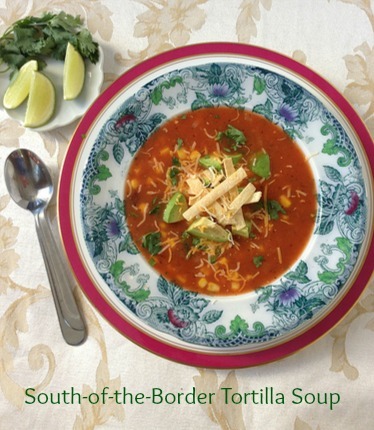 Place the corn tortilla strips in a large bowl and toss with the remaining 1 tablespoon oil until well coated. Place on a baking sheet and cook until golden and crispy, stirring halfway through to ensure even cooking, 10 to 15 minutes. To add more body to the soup, whisk together the cornstarch and water in a small bowl (this is called a slurry). Bring the soup back up to a boil, stir in the slurry, and cook, stirring constantly, until the mixture thickens slightly, about 3 minutes. 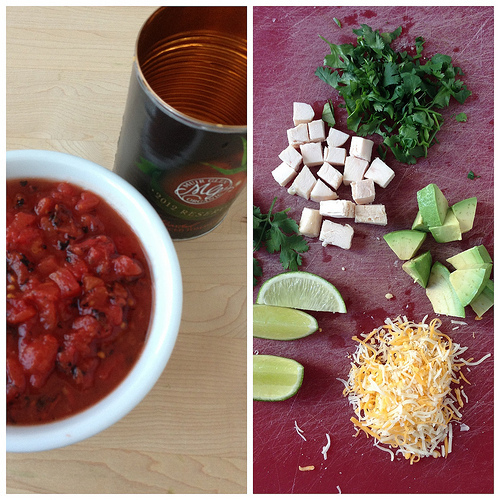 Serve in individual bowls, top with the tortilla chips and the optional toppings as desired. Each serving has 10% vitamin A, 10% vitamin C, and 10% iron.